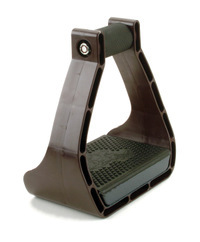 Kick Off 2009 with a new pair of E-Z Ride Nylon stirrups with or without cages! These light weight stirrups offered by EasyCare are less expensive than the aluminum type and are made with heavy duty high tech polymar. 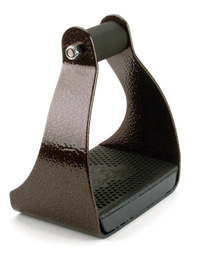 The E-Z Rides are becoming one of the most popular endurance stirrups made. For this great special you can order as many pairs as you would like on our website only. It's simple, just enter the Promo Code: EZ RIDES on your order and the discounted amount will be applied to your total. Remember to indicate color choice of either black or brown and the size of the shock absorbing top bar you will need. The offer is good from Jan 5 through Jan 31 so get your orders in right away! Did you know that horseback riding has a higher number of injuries per year than motorcycle riding? Most accidents are caused by falls off the horse which can lead to serious or fatal injuries. Although most accidents occur while riding, some also take place handling, grooming, feeding or booting the horse. The Hughston Health Alert has some great tips on preventing injuries when horseback riding. Their article, "Horseback Riding Injuries and Safety Tips", has some great information on staying safe while riding. Hard shell helmets should be worn at all times when mounted. A properly matched boot/stirrup combination is very important. Our E-Z ride stirrups with the thick, closed-cell foam pad provides comfort for the knees and back and helps prevent overall fatigue. Optional nylon safety cage available for all models. You should wear properly fitted boots and gloves. The gloves should be of a non-skid type. Check out our Nitrile Tough EasyCare Gloves that fit like a second skin. These gloves are simply wonderful for using around the barn and while working on our horses hooves and while booting. Amateur riders should not attempt jumps or daredevil stunts. There are a lot of interesting facts regarding injuries, so you should check out their article. Be safe and have a happy riding season! The June website sale is: 10% off the purchase of standard Aluminum or Nylon EZ-Ride Stirrups ordered through our site. (Does not include leather covered, Tapaderos or cages) Use promo code: EZRIDES for the discount on your order. There is no quantity limit on orders, so you can buy that extra pair you have been wanting. Get your riding buddies or your friends down at the barn to put together an order and share the freight costs. This would be a great gift for that special person or family member that you just don't know what to get. This sale is good June 1-30, 2008, so place your order and buy yourself a new pair of stirrups for this riding season and get a deal! Just a reminder that any Easyboot, Epic, Bare, Old Mac, Grip, or EasySoaker boot you purchase as well as our EZ Ride Stirrups , Stowaway Saddle Packs and Shear Comfort Sheepskins come with the EasyCare 90 day repair or replacement guarantee on quality and workmanship. A warranty card to mail to us comes with your purchase, but you can do your warranty registration on-line to save a stamp and time! Under the "Our Boots" tab, click on "Warranty Registration" or you can do it right now by clicking here. Are you looking for a bargain? Check out the EasyCare bargain bin on our website. We have seconds and discontinued items including, Boa boots, Epics, Easyboots, Easy Soakers as well as some E-Z Ride stirrups. All items are final sale and are not returnable or exchangeable. They are available on the web only. Click here to see what is available. Hurry quantities are limited! EasyCare has EZ Ride Stirrups in the Bargain Bin. Limited supply so act fast. Do you do a lot of riding in rough terrain or just some good ol' fashion hard work? These stirrups would be excellent for these types of situations and you would not have to worry about chipped paint. With the shock absorbing top-bar, you could be more comfortable when riding. These powder painted stirrups are from third party vendors and were damaged at their facility. The pads were not glued on by EasyCare and there are visible chips and scratches. There are limited top bar sizes but you could always purchase the top bar separately in the correct size at $7.50 each. Other than what is indicated above, there is nothing wrong with these stirrups. They are 5" wide and 4" deep from toe to heel and these dimensions allow for the best possible weight distribution. The pad provides comfort for the knees and back and helps prevent overall fatigue. They are sold as a pair at a great bargain of $33.00. 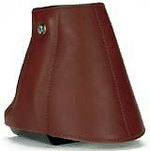 Check out our Bargain Bin for these stirrups as well as boots. Want some more information on the boots in the Bargain Bin, check this blog out from March of this year. Yes, it's back! Until further notice we will be re-instating the hoof boot exchange program at EasyCare as originally done for the month of March. The program was such a great success that we have decided to bring it back in. Beginning June 1, you can send in any style of boots (limit 2 per customer), they must be riding boots, in exchange for a different style of boots. You can trade in any hoof boot for 1/2 price on any of our other style of boots, Epics, Bares, Old Macs, Grips and Boas. We will be donating the used boots to rescue organizations. If you know of a rescue or rehab organization that could benefit from a donation of hoof boots, please refer them to the donations request form on our website. If you are thinking of trying out a different hoof boot and have another brand or style of boot, you'll know if you trade them in through the EasyCare Upgrade Program that they will be put to good use. The exchange process is simple, you can print out the order form, fill it out and return it with your boots. Exchange boots must be returned with this form. Exchange boots sent to EasyCare without this form completely filled out will be returned to the sender at the sender's expense so please be sure to include your form. Happy Riding Everyone! Pete Ramey, World Renown Natural Hoof Care Specialist. The first Pete Ramey episode is one of our best sellers- this episode is sure to surpass it in popularity! Once again, Pete explains how the practice of Natural Hoof Care has taught horseowners and farriers alike and I am sure he will talk about the benefits that Easyboots can have during the transition from shod to barefoot. So don't miss this Show and all the usefull information you will learn, that can help you ease the transition from horseshoes to barefoot. The E-Z Ride Stirrups are available in Aluminum or Nylon, but both are still lightweight. Each stirrup was weighed without the top bar attached and without a Nylon Safety Cage. Each weight given below is per stirrup not per pair. Standard Leather Covered weighs 1lb 2.3oz. Aluminum Tapadero weighs 1lb 13oz. Nylon Tapadero weighs 1lb 12.5oz. If you have the cage attached, add an additional 2.1 oz to your stirrup weight. Also take into account your top bar. The heaviest top bar is a 3inch top bar at a weight of 3oz. Some other additional information that you may find helpful. The area for your foot, between the bottom of the top bar to the top of the pad is 4 3/4". They are 5" wide from side-to-side and 4" deep from toe-to-heel. This is standard for both Aluminum and Nylon. Did you know that you can view and shop from our Catalog, read our Brochures, Instructions, Manuals and view our Videos all on our website www.easycareinc.com? 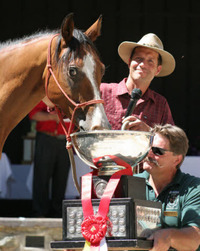 EasyCare Specializing in Natural Hoof Care for Horses. Quite often we get calls and emails regarding our shipping options. For international orders customers have the choices of Air Parcel Post, FedEx Economy and UPS International. Air Parcel Post takes about 4-10 business days to reach the customer. FedEx and UPS generally take 5-7 days, sometimes quicker! The customer must remember that these times do not include any delays that may occur in customs. For customers within the United States your choices are FedEx 3 Day Saver, FedEx Ground Service, UPS 2nd Day, UPS Next Day and UPS Ground Service. When calculating days, please note that these are business days, weekends are not included. If you wish to have an order delivered on a Saturday, you will need to contact us directly. Also please remember orders are shipped out within 48 hours of receipt of the order. If you have any questions regarding your order or with your shipping options, please feel free to contact us. Our business hours are Monday through Friday, 8:00 am to 5:00 pm Arizona time. When placing an order on our website, an item may indicate that it is currently not available. Please contact us at 800-447-8836 for an approximate ship date, or you may want to contact a dealer in your area who might have the item in stock. If you do find the item, and you had already placed an order with us, please let us know so we can cancel the order. Did you know that in addition to offering our horses comfort for their hooves EasyCare also offers riders comfort with our E-Z Ride Stirrups. These long-wearing stirrups come standard with our comfort top bars in various styles.